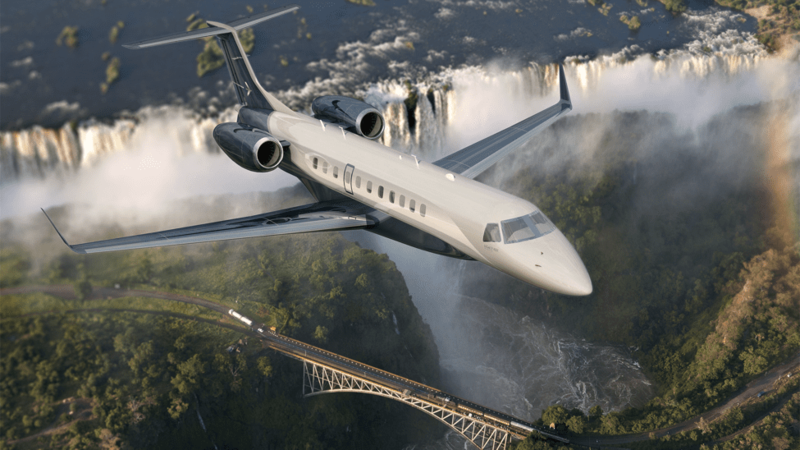 With over 40 years of experience producing successful aircraft that are delivered worldwide, Embraer introduces the Legacy 650E, which will replace the already successful Legacy 650. Standing for Evolution, the 650E is scheduled to enter into service this year and is priced at $25.9 million. To create the ultimate flight experience, Embraer added tools for business, entertainment, and relaxation to the Legacy 650E so that passengers can fly any way they choose. In the three zone cabin that seats up to 14, travelers can choose from multiple interior configurations based on their needs. Options include a conference table area, third private zone configurable with two divans, and an optional forward lavatory with vanity. Restyled seats are fully berthable and are designed with premium leather. In one of the quietest cabins in its class, passengers can enjoy full HD systems with surround sound, Apple TV, cabin Wi-Fi, Blu-ray players as well as XM radio aboard the 650E. Additionally, a door separating the cabin from the galley and cockpit ensure total passenger privacy and comfort. With a range of 3,900nm, the 650E can fly from London to New York or São Paulo to Miami without stopping. 240 cubic feet of baggage capacity is fully pressurized with temperature control, while an additional 46 cubic feet of storage is internal and allows passengers to store personal belongings that can easily be accessed in flight. Two Rolls-Royce AE 3007A2 engines each deliver over 9,000 pounds of thrust to the aircraft and allow it to fly at .80 Mach. 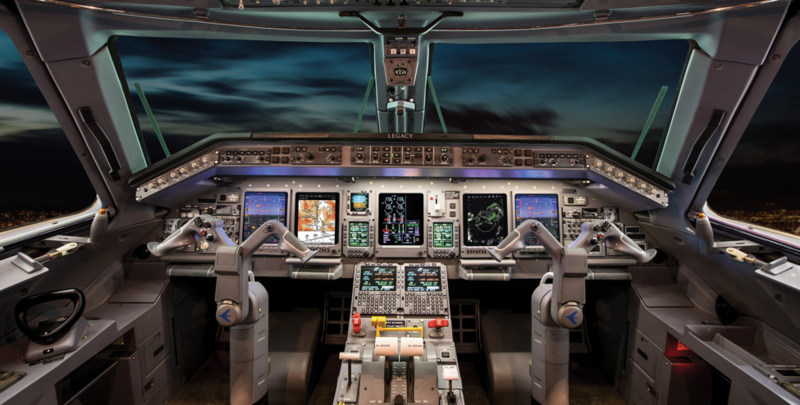 In the avionics suite, Honeywell Primus Elite is pilot friendly and organized over five LCD displays. Included in the suite is a synthetic vision system, XM weather capability, auto throttle and more. Additionally, a brake-by-wire system controls temperature monitoring and has anti-skid protection. The Legacy 650E will have a 10 year/10,000 flight hour warranty and 99.5% dispatch reliability. 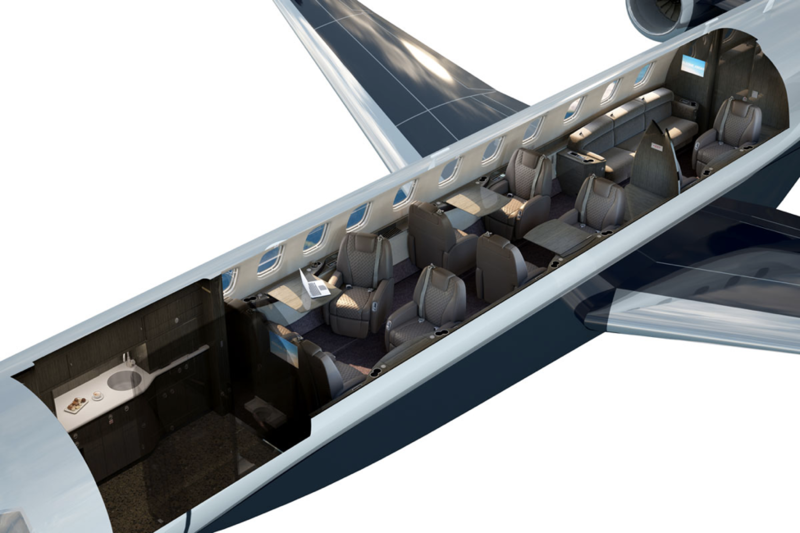 With low operating costs, transcontinental range, and exceptional cabin comfort, the 650E is sure to be another success in a long line of executive jets by Embraer.